​When the MIZ-21C is used along with Zetec Surf-X Array Probes, it’s the most cost-effective, portable surface array solution in the market. This solution delivers significant inspection advantages over Liquid Penetrant Testing (PT) and Magnetic Particle Testing (MT). MIZ-21C is an affordable and capable handheld device that can handle inspections virtually anywhere. With best in class features that not only save time but open the door to new inspection possibilities. Onscreen keyboard further increases user efficiency. ​MIZ-21C offers a range of accessories designed to meet your specific inspection needs. Removable cover with adjustable hand straps and stand is included with all MIZ-21C models for added protection, convenience and extended operation. 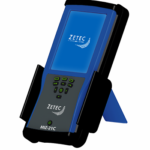 Zetec’s ZM-5 High-Speed Scanner is a convenient handheld tool designed for rapid and thorough inspection of small diameter holes, such as bolt hole and fastener holes. With an ergonomic design, the ZM-5 enables inspection of the hardest to reach areas. A rotating transformer couples the eddy current signals for an improved operating life over conventional slip rings. The ZM-5 uses a quick-disconnect cable design for easy replacement. Through adapters the MIZ-21C can drive other manufacturers’ rotating scanners. Introducing the Zetec Surf-X line of array probes. Featuring a unique flexible circuit design and proprietary X-Probe technology, Surf-X array probes can lower total cost of ownership while providing excellent data quality as well as faster, safer inspections when compared with other inspection methods. Inspecting Corrosion or Cracking in Pipes, Pressure Vessels, or Tanks. Surf-X flexible array probes can conform to gradual changes in the geometry of pipes, pressure vessels, or tanks to detect surface and sub-surface flaws in a variety of materials including aluminum and stainless steel. Corrosion is a common flaw in non-pressurized components, while stress corrosion cracking is common in components subjected to sustained tensile stress in a corrosive environment. The Surf-X array probe can easily detect the locations of both types of defects using the high precision embedded encoder to track position. ​Assessing and Sizing Cracks in Raised Welds and Friction Stir Welds. Surf-X flexible array probe can also conform to geometry changes associated with raised welds to simultaneously inspect for axial and transverse cracking in the weld cap, toe, and heat-affected zones. Surf-X array probes use position indicators on the probe to help with alignment to ensure the entire area of interest is inspected. The flexible nature of the Surf-X array probe allows for the inspection of flat surfaces including friction stir welds. The long-life wear surface has been tested to 10,000 ft, and is an inexpensive field replaceable component.